. :: COMPARATIVE EFFICACY OF INTRA-ARTICULAR MEDICATIONS ::. Intra-articular treatment with triamcinolone compared with triamcinolone with hyaluronate: A randomised open-label multicentre clinical trial in 80 lame horses. The use of intra-articular corticosteroids in combination with hyaluronate is frequently said to be superior to intra-articular corticosteroids alone, although no study has supported this opinion. In this multicentre randomised clinical trial horses with lameness localised to a single joint were randomly allocated to receive either triamcinolone acetonide or triamcinolone acetonide in combination with hyaluronate, via the intra-articular route. Lameness was assessed prior to treatment and three weeks after. A successful outcome was defined by a reduction in lameness by two or more grades. The proportion of horses returning to their previous level of performance at 3 months was also assessed. 80 horses were recruited, 39 received triamcinolone alone and 41 horses received the combined treatment. 87.8% of horses receiving just triamcinolone had a successful outcome at 3 weeks, compared with 64.1% receiving the combined treatment (P=0.01). 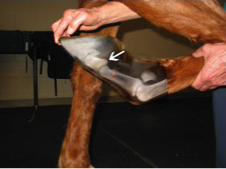 Both treatments were associated with a significant reduction in lameness and joint effusion. Approximately half the horses in each group had returned to their previous level of performance at 3 months. Horses aged greater than 13 years had reduced success rate of the combination treatment. The combination treatment of both triamcinolone acetonide and hyaluronate administered intra-articularly was less effective in the short term than intra-articular triamcinolone alone; at 3 months approximately half of horses in both treatment groups had returned to their previous level of performance.